Motivated by moose management practices, the Ministry of Natural Resources and Forestry (MNRF) submitted a proposal December 2015, to the Environmental Registry, seeking amendments to regulations affecting wolf and coyote hunting in Northern Ontario. 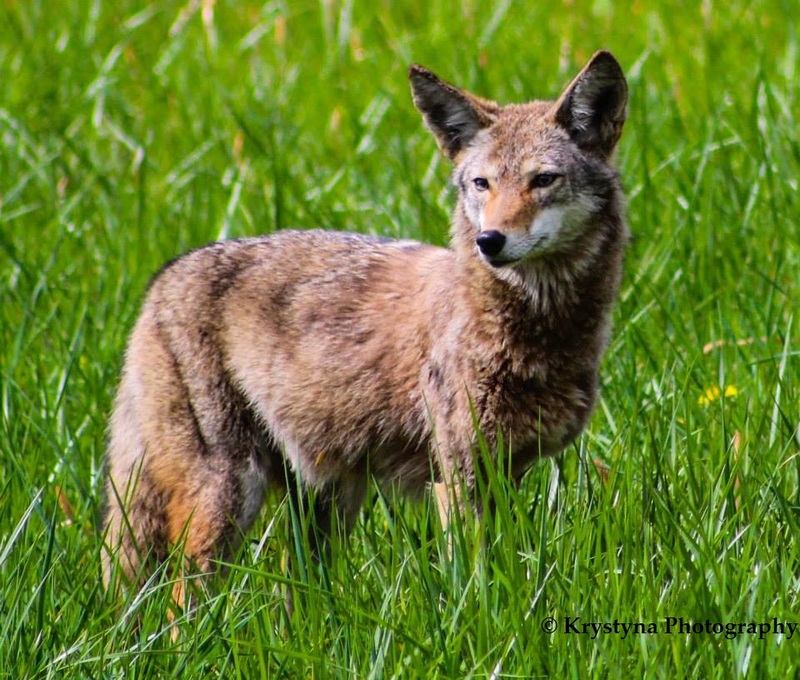 Priority recommendations suggest removal of the $11 game seal fee, removal of harvest limits on coyotes and elimination on reporting requirements of hunting activities. Unchanged by the proposal would be the existing two bag limit on wolf per hunter per year and the requirement to report harvesting. Hunters would only require a small game licence to shoot wolves or coyotes. 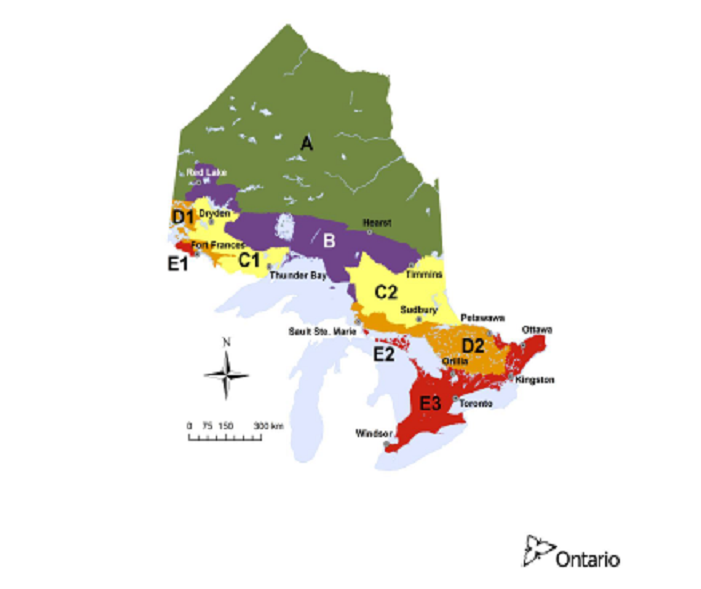 Northern Ontario is populated by two wolf species, the Grey Wolf and the Eastern Wolf. According to the MNRF, proposed changes intend to: address the concerns in recent years about the impacts of wolf predation on moose in northern Ontario; address concerns about the requirement to purchase a seal in northern Ontario; maintain controls necessary to ensure the sustainability of wolf or coyote populations in northern Ontario; and not impact current protections for the Eastern Wolf population in their core range in central Ontario. Regarding the management of moose populations through proposed amendments, even supporters of the proposal question the efficiency of the above rationale. Higher populations of prey species, such as moose and deer, can support higher populations of wolves. Predation rates on moose by wolves tend to increase in tandem with moose numbers. This naturally regulates the density of the moose population and is ultimately beneficial to moose and the ecosystems they rely on. At very high densities, moose populations can degrade their own habitat, and experience increased occurrences of parasites such as winter ticks. Moose with brain worm or high numbers of winter ticks may be easier wolf prey in late winter. The number of moose killed per wolf pack will not significantly decrease as the pack size is reduced, so removing just a few wolves from each pack will not decrease overall predation on moose. Only the removal of an entire pack can substantially reduce predation but this practice may not be ecologically or socially desirable. provincial Endangered Species Act,” commented Dr. Bell. actually abuts the region of Algonquin Park and surrounding townships – the stronghold of the at-risk Eastern Wolf,” she remarked. 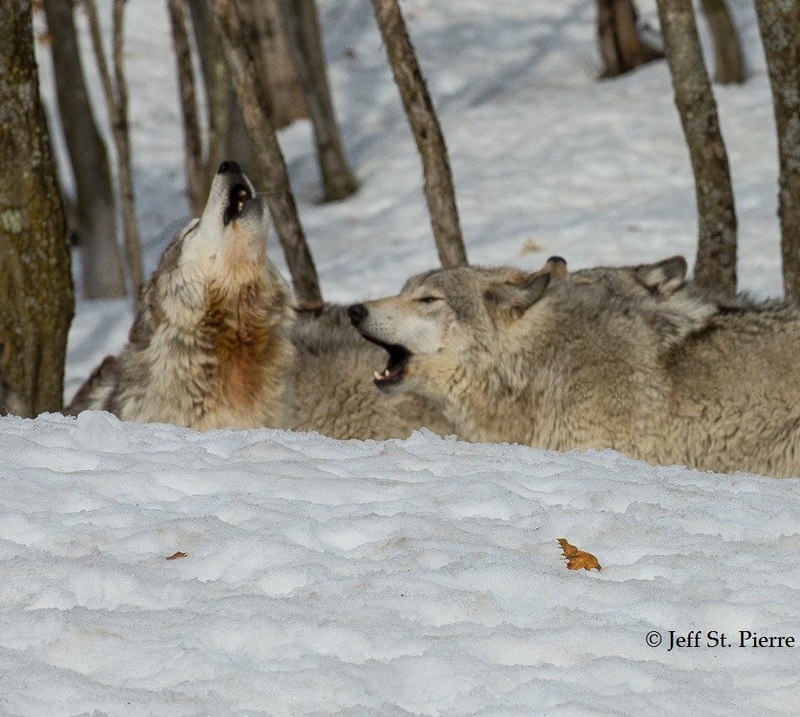 Human boundaries will not prevent the movement of the Eastern Wolf out of protected zones. 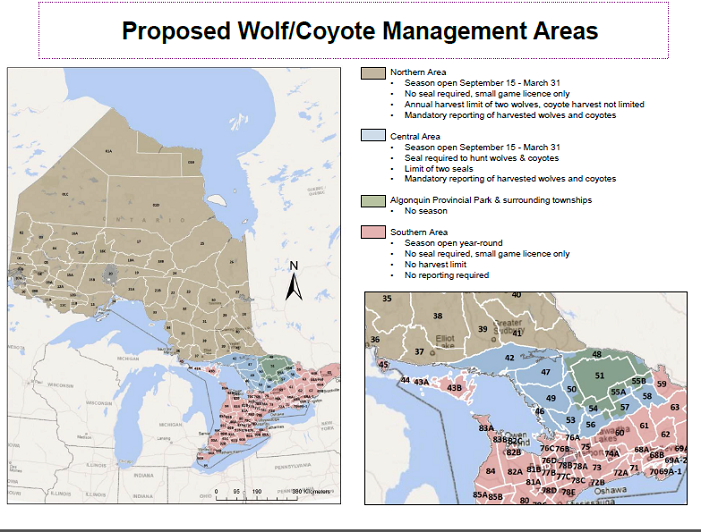 The Committee on the Status of Species at Risk in Ontario (COSSARO) is reassessing the classification of the Eastern Wolf his year. “The Eastern Wolf may well be bumped up to classification under a higher level of risk,” remarked Dr. Bell. A higher classification status would indicate ‘Endangerment’ of the species and could lead to protective measures. Further challenging the survivability of the Eastern Wolf is the difficulty in distinguishing the species from the Eastern Coyote. It has been noted of hunters and biologists alike, distinguishing the Eastern Wolf from the Eastern Coyote in the field is impossible. Eastern Wolves can only be distinguished from Eastern Coyotes through genetic analysis. According to Dr. Bell, this confusion is especially troubling should the MNRF’s recommendation to remove harvesting limitation on coyotes become a regulation in 2017. Generally, wolves prey mostly on young moose and older moose past their prime, and consume few prime-breeding-age moose. However, moose populations in areas that are the most heavily hunted tend to include fewer calves and older moose. As a result, wolves prey on more prime-breeding-age moose during the winter months in these areas. This results in overall higher mortality of moose and may reduce moose population growth. 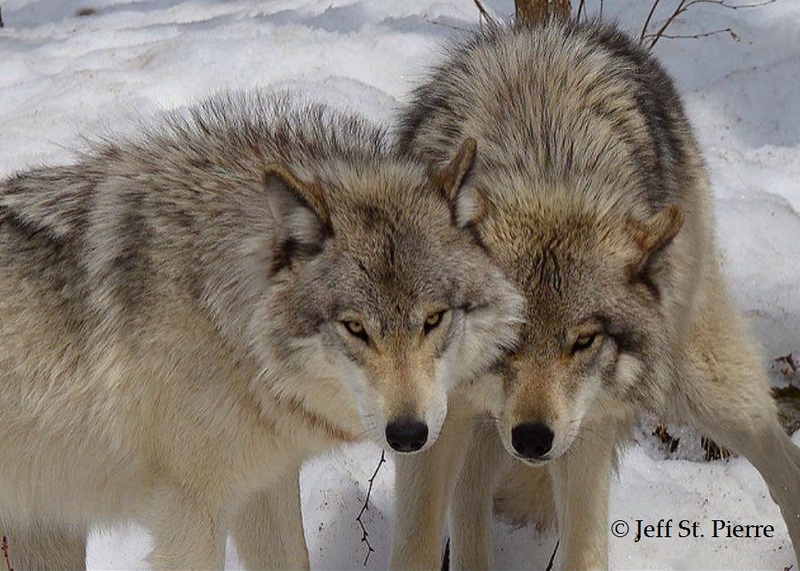 Many studies, such as the Isle Royale project, have illuminated the interconnected significance between wolves, moose and the ecology. Michael Runtz is a professor at Carleton University and one of Canada’s most highly respected naturalists as well as a best-selling author. Included among his ten best sellers is his book The Howls of August: Encounters with Algonquin Wolves. 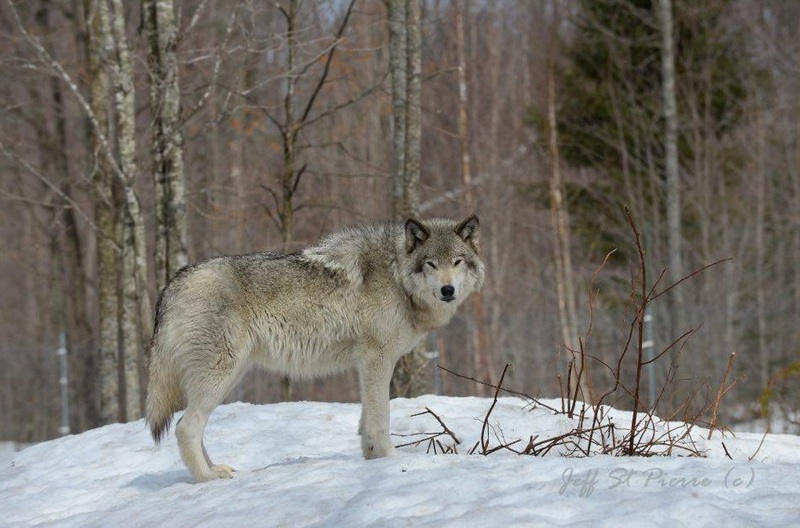 Runtz also leads annual public wolf howls for Bonnechere Provincial Park and Algonquin Park. 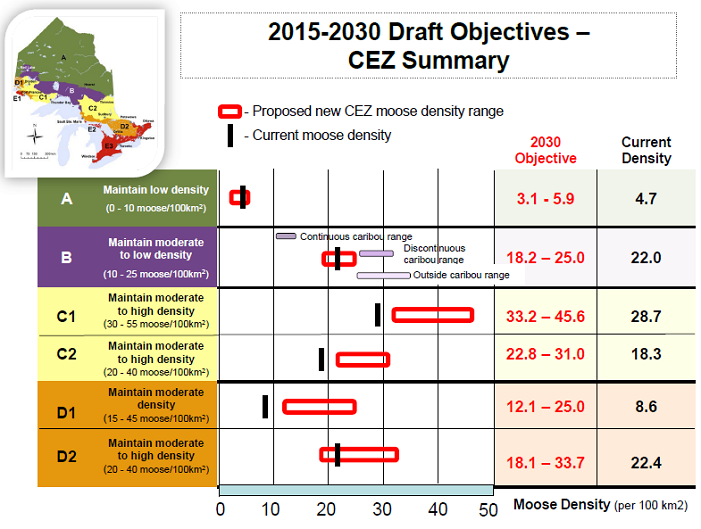 Runtz corroborates MNRF’s above observation that wolves typically do not prey on prime moose. It is the job of the MNRF to apply conservation science to steward wildlife and the complex ecosystems that they inhabit, and to educate the public about ways to maintain healthy, functioning ecosystems. The proposed changes, and lack of accompanying monitoring will spur antipathy towards wildlife that was more typical of unenlightened times. 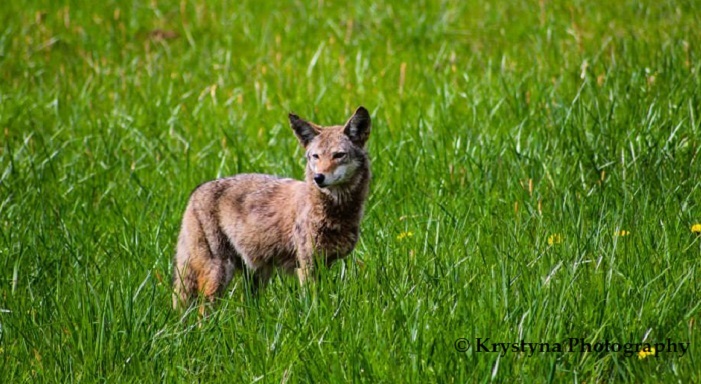 The decreased oversight and removal of any limits to the number of coyotes that can be killed feeds a regrettable and indefensible narrative that predators are vermin as opposed to an integral and crucial part of natural communities that have evolved over thousands of years. 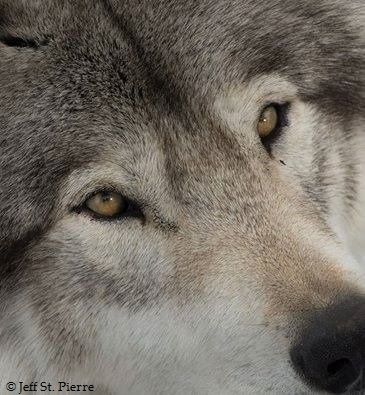 While it is indisputable to many that wolves –and coyotes, are critical for the preservation of ungulates and the ecosystem, Runtz is quick to point out that there is a significant primal connection between humans and wolves. As mankind spreads his mark across the landscape, the wolf is an important reminder that we are also natural creatures and must achieve respect and harmony with all the creatures upon this earth. When one considers the contributions that wolves make to the ecosystem and the obvious point that nobody eats wolf meat, answering the question ‘why hunt wolves’ becomes challenging. Ryckman offered an answer. As noted at the beginning of this article, residents pay $11 for a game seal but out of province hunters shell out $272 for the seal. Information provided by OFAH establishes in 2013, wolf and coyote hunting game seals generated about $130,000 to the province. An insignificant amount when compared to the financial revenue generated the same year through the sale of game seals for bear -at 50 bucks a ding, the province pulled in about a million bucks. In 2013, about 20,000 bear game seals were sold in Ontario -16,000 going to provincial residents and 4,000 going to non-resident hunters. The number of wolf and coyote game seals sold the same year pales in comparison – a total of 3,800 with 300 of those sold to non-resident hunters. That same year, 130 wolves were harvested in the province of Ontario- a success rate of approximately 3.5%. The numbers suggest that not only is wolf hunting challenging, it is also unpopular, and coupled with the ineffectiveness of increasing moose population by reducing wolf populations, MNRF’s proposed amendments seem pointless. Those who oppose the recommendations, like Ontario Nature, are scratching their heads and trying to figure out the sense in this proposal. Commenting on the Environmental Registry is now closed. Members of the public may send their comments or concerns to Bill Mauro, Minister of Natural Resources or contact their MPP.